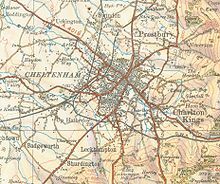 For other places with the same name, see Cheltenham (disambiguation). Cheltenham (/ˈtʃɛltənəm/) is a regency spa town and borough on the edge of the Cotswolds in Gloucestershire, England. Cheltenham has been a health and holiday spa town resort since the discovery of mineral springs in 1716 and has a number of internationally renowned and historic schools. 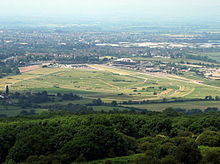 The town hosts several festivals of culture, often featuring nationally and internationally famous contributors and attendees, including the Cheltenham Literature Festival, the Cheltenham Jazz Festival, the Cheltenham Science Festival, the Cheltenham Music Festival, the Cheltenham Cricket Festival, and the Cheltenham Food & Drink Festival. In steeplechase horse racing, the Gold Cup is the main event of the Cheltenham Festival, held every March. Though little remains of its pre-spa history, Cheltenham has been a health and holiday spa town resort since the discovery of mineral springs there in 1716. Captain Henry Skillicorne (1678–1763), is credited with being the first entrepreneur to recognise the opportunity to exploit the mineral springs. The retired "master mariner" became co-owner of the property containing Cheltenham's first mineral spring upon his 1732 marriage to Elizabeth Mason. Her father, William Mason, had done little in his lifetime to promote the healing properties of the mineral water apart from limited advertising and building a small enclosure over the spring. Skillicorne's wide travels as a merchant had prepared him to see the potential lying dormant on this inherited property. After moving to Cheltenham in 1738, he immediately began improvements intended to attract visitors to his spa. He built a pump to regulate the flow of water and erected an elaborate well-house complete with a ballroom and upstairs billiard room to entertain his customers. The beginnings of Cheltenham's tree-lined promenades and the gardens surrounding its spas were first designed by Captain Skillicorne with the help of "wealthy and traveled" friends who understood the value of relaxing avenues. The area's walks and gardens had views of the countryside, and soon the gentry and nobility from across the county were enticed to come and investigate the beneficial waters of Cheltenham's market town spa. The town is near the northeastern edge of the South West of England region being 88 miles (140 km) west-northwest of London, 38 miles (61 km) northeast of Bristol and 41 miles (65 km) south of Birmingham. As with the rest of the British Isles, Cheltenham experiences a maritime climate. In comparison to many other areas in Britain, Cheltenham has warm summers and mild winters. The town held the British maximum temperature record from 1990 to 2003—temperatures reached 37.1 °C (98.8 °F). The absolute minimum is −20.1 °C (−4.2 °F), set during December 1981. During a typical year, 145.6 days will report at least 1 mm of rain, and some 42.2 nights will record air frost. Cheltenham is well-known for its nightlife, with a wide range of pubs, wine bars, clubs and restaurants. It has a Michelin one-star restaurant, Le Champignon Sauvage. Cheltenham's Municipal Offices, an example of Regency architecture. The mechanical clock in the Regent Shopping Arcade, designed by Kit Williams. The distance from the duck to the fish is 14 metres. The town is known for its Regency architecture and is said to be "the most complete regency town in England". Many of the buildings are listed, including the Cheltenham Synagogue, judged by Nikolaus Pevsner to be one of the architecturally "best" non-Anglican ecclesiastical buildings in Britain.Cheltenham Town Hall was built in 1902 to commemorate the coronation of King Edward VII and Queen Alexandra. The collection's of the Cheltenham Art Gallery & Museum include decorative arts from the era of the Arts and Crafts Movement. The collection enjoys National Designation by the Arts Council of England. The Holst Birthplace Museum contains personal belongings of the composer of The Planets, including his piano. It also includes a working Victorian kitchen and laundry, Regency drawing room and an Edwardian nursery. Sandford Parks Lido is one of the largest outdoor pools in England. There is a 50 m (164 ft) main pool, a children's pool and paddling pool, set in landscaped gardens. Sandford Parks Lido is the home of Cheltenham Swimming and Water Polo Club. Cheltenham Town Hall, erected in 1902 to commemorate the coronation of King Edward VII and Queen Alexandra. Cheltenham Spa railway station is located on the Bristol-Birmingham main line, with services to Gloucester, Bristol, Swindon, London Paddington, Cardiff Central, Bridgend, Maesteg, Plymouth and the South West, Birmingham, Derby, the North West, the North East and Scotland. The station is located in the Montpellier area of the town, to the west of the town centre. National Express operate a number of coach services from Cheltenham including route 444 to London and Heathrow airport. The town has two notable rings of bells hung for change ringing. One is at St. Christopher's (Warden Hill), the lightest ring of church bells in the world. The other is a ring of 12 bells hung in St. Mary's Church (the Minster). These were the venue in 2008 for the eliminators of the National 12 Bell Striking contest, in which teams of campanologists from around the world compete to win the Taylor Trophy. In 2017 the old ring of 12 was completely replaced with new bells cast by John Taylor & Co. The tenor bell is just over a ton in weight, and the new ring also includes a thirteenth bell, a sharp 2nd, to provide a lighter 8. The towers in the locality of Cheltenham belong to the Cheltenham branch of the Gloucester & Bristol Diocesan Association of Church Bell Ringers. The Twinning Fingerpost in Cheltenham Township, Pennsylvania, United States, highlighting Cheltenham as the "Official Twin." The signpost points to other cities in the world named "Cheltenham". ^ "Welcome to Garden Events". Garden-events.com. 17 June 2012. Retrieved 4 February 2014. ^ "Jazz, Science, Music & Literature". Cheltenham Festivals. Retrieved 8 November 2012. ^ "Chedgrave – Cheltenham | A Topographical Dictionary of England (pp. 562–569)". British-history.ac.uk. 22 June 2003. Retrieved 4 February 2014. ^ "Cheltenham Tourist Information Guide". cotswolds.info. ^ "Sports News – Sporting Chronicle: Cheltenham Festival Attendance Figures 2005". Sporting Chronicle. Archived from the original on 21 September 2013. Retrieved 4 February 2014. ^ "The Gloucestershire (District Boundaries) Order 1991". Opsi.gov.uk. 4 July 2011. Retrieved 4 February 2014. ^ "Distance between Cheltenham, UK and London, UK (UK)". distancecalculator.globefeed.com. ^ Hockin, Lynda. "Montpellier Gardens". www.cheltenham.gov.uk. ^ David Hanks. "A History of Charlton Park". Charltonparkcheltenham.org. Retrieved 4 February 2014. ^ "Hot spell August 1990". Met Office. Retrieved 4 February 2014. ^ "Cheltenham 1981–2010 averages". Met Office. Retrieved 3 May 2016. ^ "Page title goes here". Archives Hub. Archived from the original on 19 July 2012. Retrieved 4 February 2014. ^ Thompson, Jonathan (1 October 2006). "The best place to live in Britain". The Independent. London. The Independent cites property valuation web site propertypriceadvice.co.uk's Archived 24 February 2016 at the Wayback Machine survey which ranked Cheltenham No. 1 out of 1,833 locations. ^ "Britain's top 20 places to raise a family". London. Archived from the original on 9 October 2014. 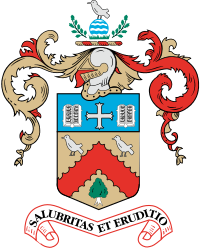 ^ a b "Cheltenham economic profile – The Cheltenham economy – Cheltenham Borough Council". Cheltenham.gov.uk. Retrieved 8 November 2012. ^ "Labour Market Statistics , December 2010". Ons.gov.uk. 15 December 2010. Retrieved 8 November 2012. ^ "Average salary falls 3pc in face of high inflation". The Daily Telegraph. London. 23 November 2011. Retrieved 8 November 2012. ^ John Burn-Murdoch (13 September 2012). "UK multi-millionaires mapped: where do the wealthy live?". The Guardian. London. Retrieved 8 November 2012. ^ Smith, Richard (13 March 2010). "Bristol named Britain's most musical city". Retrieved 4 July 2011. ^ "Arts and Crafts Museum Cheltenham". www.artsandcraftsmuseum.org.uk. ^ a b c d e f g "Cotswold Filming Locations used for Cinema & TV". Cotswolds.info. 30 January 2014. Retrieved 4 February 2014. ^ a b c d e f g "Filmed in Cheltenham - visit cheltenham". 30 June 2013. Archived from the original on 30 June 2013. ^ Geake, Simon. "Crossroads". SimonGeake.co.uk. Archived from the original on 13 August 2016. Retrieved 13 August 2016. After the in-story destruction of the motel by fire, the revamped motel was filmed from 1982 at The Golden Valley Hotel in Cheltenham; from 1985 filming moved to the Penns Hall Hotel (now Ramada Jarvis Birmingham) in Sutton Coldfield, the changed appearance explained as being due to rebuilding. ^ "Custom report - Nomis - Official Labour Market Statistics". Nomisweb.co.uk. Retrieved 5 February 2019. ^ "Cheltenham ranked one of safest student towns in UK". Gloucestershire Echo. Archived from the original on 28 February 2014. ^ A Concise Description of the Endowed Grammar Schools in England and Wales. Baldwin, Cradock and Joy. 1818. p. 446. ^ "Cheltenham Education: Cheltenham College". Cheltenham4u.co.uk. Archived from the original on 27 December 2013. Retrieved 4 February 2014. ^ "BFI Screenonline: Anderson, Lindsay (1923–1994) Biography". Screenonline.org.uk. Retrieved 4 February 2014. ^ "Cheltenham Events – Festivals: Cheltenham Cricket Festival". Cheltenham4u.co.uk. Archived from the original on 22 February 2014. Retrieved 4 February 2014. ^ "Cheltenham Education: Dean Close School". Cheltenham4u.co.uk. Archived from the original on 22 February 2014. Retrieved 4 February 2014. ^ "Going is good for Cheltenham". BBC Sport. 17 March 1998. Retrieved 10 March 2009. ^ "Cheltenham festival gets underway this afternoon". The Belfast Telegraph. 10 March 2009. Retrieved 10 March 2009. ^ "Cheltenham Festival 2015 in numbers: £150million in bets, 10,745 bottles of champagne and 250 chefs". Gloucestershire Echo. Archived from the original on 5 July 2015. ^ a b c Verey, David (1970). Gloucestershire: The Vale and the Forest of Dean. 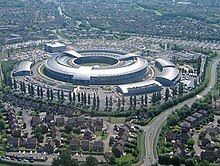 The Buildings of England. 2. Harmondsworth: Penguin Books. p. 128. ^ "St. Christopher's Church". Tciwh.org.uk. 13 July 2001. Retrieved 26 March 2013. ^ "Cheltenham Twinning Association". Cheltenhamtwinning.wordpress.com. 22 October 2013. Retrieved 5 February 2014. ^ "Information on other Cheltenhams around the world – Other Cheltenhams – Cheltenham Borough Council". Cheltenham.gov.uk. 20 November 2008. Retrieved 5 February 2014. ^ "Cheltenham Twinning – Cheltenham, PA". Cheltenhamtownship.org. Retrieved 5 February 2014.